Fly Rig 5, Multi-Effects for Electric Guitar from Tech 21. The Tech 21 Fly Rig 5 is a multi-effects pedal small enough to fit in a backpack, or in the pocket of most guitar bags. Featuring Tech 21’s signature analog tone, it can be used either through an amp, or as a complete rig direct to a PA or DAW. The metal-housed unit is only 11.5 inches wide and 2.5 inches deep, so it takes up very little room compared to a typical multi-effects pedal or a pedalboard. The “5” in its name refers to the number of effects it offers: a SansAmp amp emulator, a Plexi section based on the company’s Hot Rod Plexi pedal, an independent gain boost, a delay based on the Boost DLA tape echo pedal, and a digital reverb. Though digital, the reverb and delay are configured as parallel effects, so the signal path remains analog. The control knobs are plastic and backlit in a different color for each section: blue for the DLA, yellow for the SansAmp, and red for the Plexi. By necessity, the knobs are quite small, but they’re easy enough to adjust. Behind each knob is a printed legend of its function. The I/O is simple as it gets: a 1/4” high-impedance instrument input and a 1/4” low-impedance, instrument-level “universal” output. The output is compatible not only with amps, but with DI boxes, mixers and PA systems. The unit is powered by an included, 12V power supply. Let’s look at the individual components within this compact but powerful multi-effects unit. 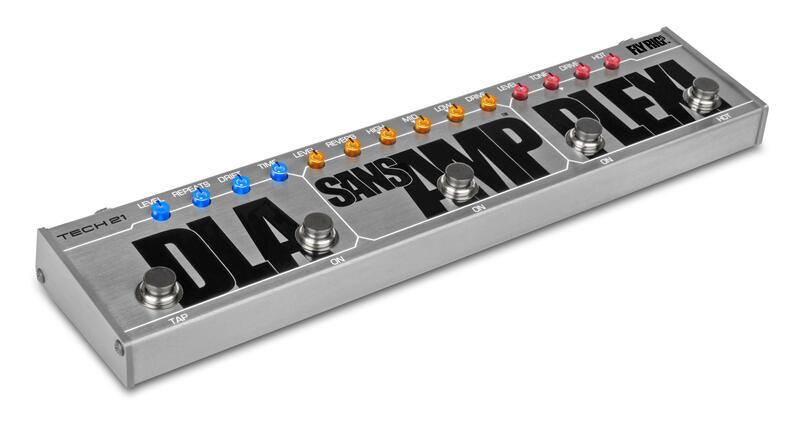 The SansAmp section is the heart of this pedal, and you’ll probably keep it on all the time. It has a single on/off footswitch (a buffered bypass), and control knobs for Level, Reverb, High Mid Low and Drive. With the Drive set at around 11 o’clock, the SansAmp adds sustain, bite and fullness to the dry sound. Cranking the Drive gives you everything from light crunch to a thicker overdrive. Here's a crunchy, bluesy lead sound, with the Fly Rig 5 going through a Fender Twin (Blackface reissue) and miked with a Shure SM57. I often used the SansAmp section with the Hot function activated via its dedicated footswitch. Although grouped in with the Plexi section physically, the Hot switch works independently of it, offering an extra 21dB gain boost that adds extra oomph to clean sounds and especially to crunchy or distorted ones. The Reverb is designed to sound like a spring reverb, and frankly, it sounds better than most real spring reverbs I’ve used. It’s warmer, more even, and less boingy. When the Fly Rig is connected direct, the cabinet emulation in the SansAmp provides a very realistic sound. Here's a doubled, distorted rhythm guitar part recorded DI through the Fly Rig 5, using the SansAmp (including reverb) and Plexi sections with the Hot switch on. Based on the circuitry in the Hot Rod Plexi pedal, the Plexi section offers an On switch and the aforementioned Hot switch, which kicks it into overdrive. Other controls are Level, Tone, Drive and Hot level. Sonically, the Plexi section sounds very much like the dedicated pedal: big, fat and Marshall-like. 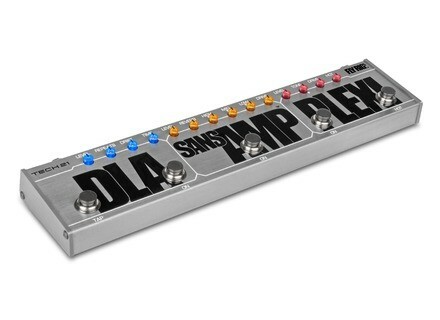 You can get some extreme high-gain sounds with both the SansAmp and Plexi’s drive controls turned up. Like with the Hot Rod Plexi, though, I found that extreme settings were not as pleasing or convincing as when I backed the Drive off a little bit, which still provided tons of gain. This example, again with the Fly Rig 5 connected to the Twin and miked with the SM57, features the SansAmp Drive around 1 o'clock, the Plexi Drive around 2 o'clock, and the Hot set to about 3 o'clock. The DLA effect is a tape echo emulation, with up to 1000ms of delay available. It features two footswitches: On and Tap [tempo]. Control knobs are comprised of Level, Repeats, Drift, and Time. The Drift control inserts some random modulation, adding to the tape echo vibe. It’s a great sounding delay, and having the tap tempo footswitch so readily available is extremely handy. I use it all the time for live tempo syncing. This example features a clean sound with delay, again miked through the Twin with a Shure SM57. I tried out the Fly Rig 5 at rehearsals and gigs, and was always able to quickly dial in a very pleasing sound through my amp. I was equally happy with it for direct recording of both clean and distorted amp sounds. To get a good sense for its capabilities, I’ve purposely used it instead of my regular pedalboard for all my rehearsals and gigs over the past few weeks. With the exception of a tuner, which I supplement it with, it’s given me all I need, and lightened my load considerably. For situations where I require more effects, I could easily plug an additional pedal or two inline. In fact, the Fly Rig 5 sounds so good that I could envision a scenario where I added it to my full-size pedalboard in place of the delay and overdrive pedals, but used it by itself in situations where stage space was tight or I needed to travel light. Much as I’ve been enjoying the sound and convenience of this unit, I have a few wish list items for a Fly Rig 5 version 2. One would be to add a noise gate. Not unexpectedly, the high-gain settings generate a lot of buzz, so it would be nice to have a gate that you could switch in when necessary. Improved visibility for the parameter-knob names would also be helpful. To keep the size of the pedal down, the knobs had to be made quite small. The problem is that the identifying text above each one is hard to see when the pedal is on the floor and you’re standing above it, especially in low light. Tech 21 acknowledges that, but says that after a while you’ll memorize what each knob does. Perhaps the solution would be to make the text backlit, or maybe print an identifying initial on each knob. I’m not sure what would be feasible, but it is an area that could be improved. I’d also like to see Tech 21 offer a soft case for the Fly Rig 5. It would be helpful for better protecting the plastic buttons on the pedal when it’s packed in with other gear and being carried and jostled around. In designing a multi-effects pedal this small, Tech 21 had to make hard choices as to what to leave off, and, as far as I’m concerned, did an excellent job of it. They found the sweet spot where compactness, sound quality, and utility all meet. And when you factor in the $249 price tag, which is very modest considering what’s included, you’ve got yourself one heck of a deal. My prediction: this small pedal is going to be huge.